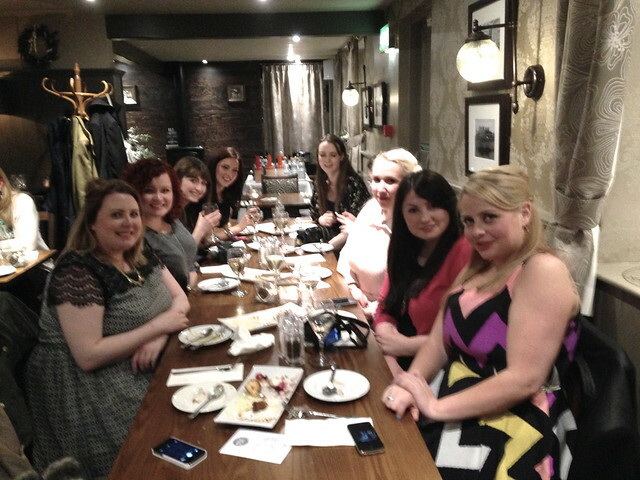 Last week I was kindly invited along to the West Port Hotel in Linlithgow to sample their new menu along with a group of other Scottish bloggers. The West Port has recently reopened with a fresh new look after a £450,000 refurbishment which saw the old bar and restaurant knocked together into one big space. Along with the redesign came a brand new menu and a new range of premium wines and craft beers. 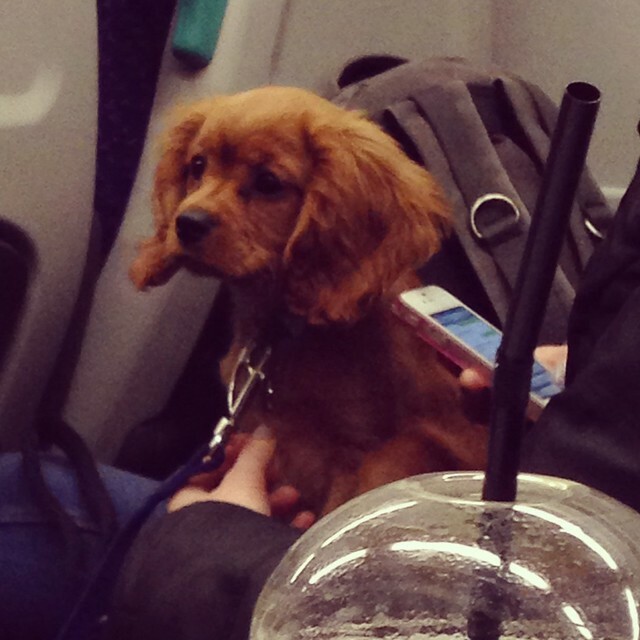 So on Thursday evening I got the train through to Linlithgow with Kirsty, Laura, Gillian, Jade, Leanne and Terri where we drank cocktails in cans and sat next to the cutest dog in the world (just look at it!!). Once we arrived at the restaurant we found Lynsey and Iona waiting for us at a big long table that they'd put together for us. 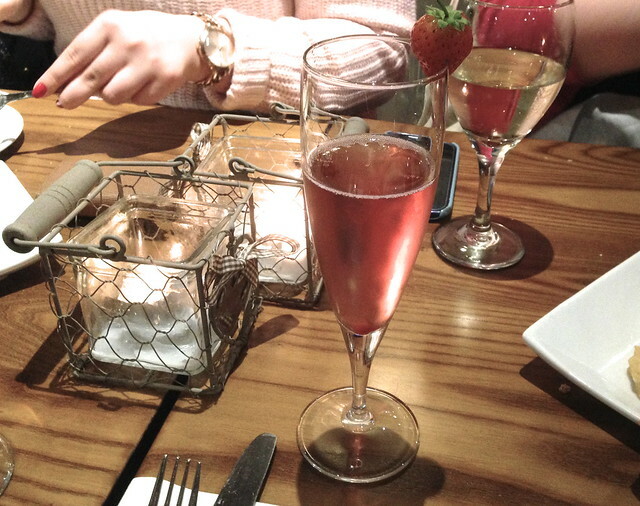 We were welcomed with a glass of our choice so I went for white wine, although later switched to some fizz which came with a splash of blackcurrant and a strawberry, delish! 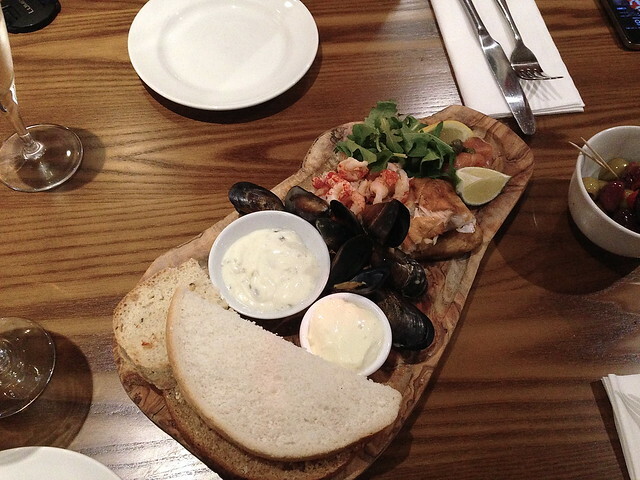 Once we'd got settled the waiting staff brought out a selection of sharing platters for our table - there was an Italian meats platter, a vegetarian platter and a mixed seafood platter (this was the one at my end of the table). I'm not normally a fish fan but I really enjoyed the crayfish (which I actually thought was prawns to start off with...oops) and I'm even starting to enjoy smoked salmon. 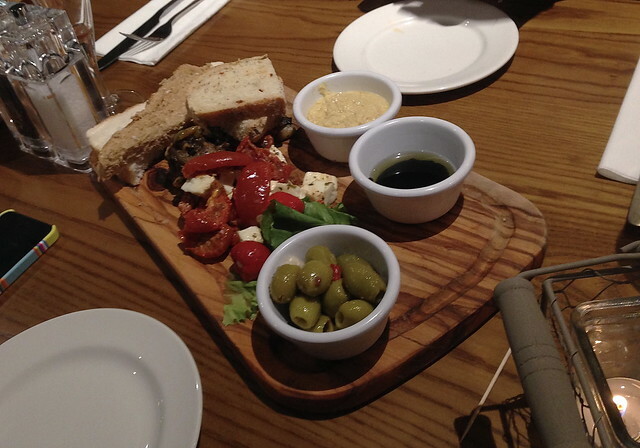 I also had a wee taste of the vegetarian platter and the sunblush tomatoes and mozzarella were a lovely combo. 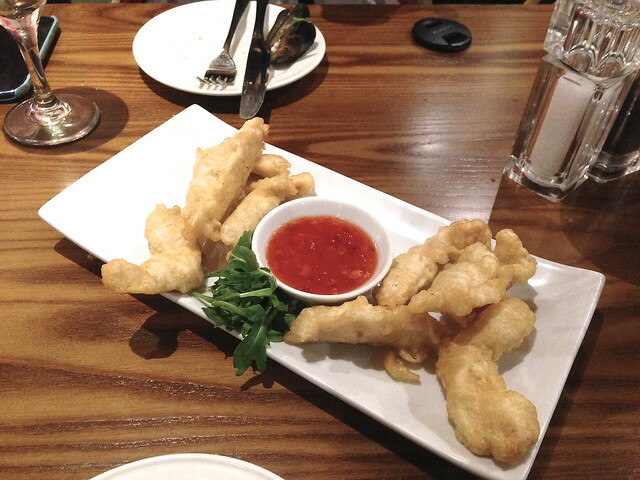 Next up was another dish from the starters menu - tempura chicken with sweet chilli dip. 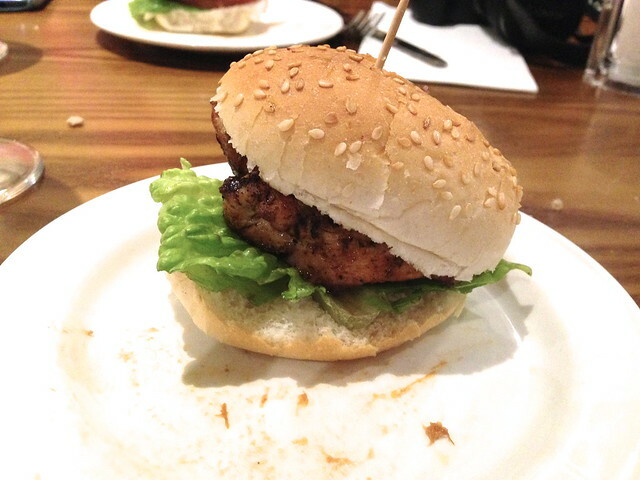 Now THIS was delicious - the batter was so light yet crispy and the chicken just melted in your mouth. 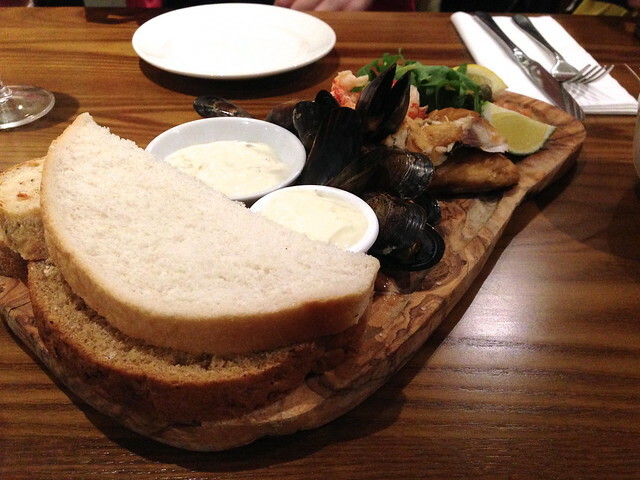 I'm so glad we had a plate between 2 as I would definitely would have been craving more if I'd only had a few bits! We were then brought out various bits and bobs from the mains list including slow-cooked pulled pork with bbq sauce & grilled apple (man I love pulled pork and this was perfect), Moroccan lamb stew with herb couscous (a bit too spicy for me), and mini cajun chicken fillet and flame grilled gourmet beef burgers (loved the chicken - often I find with chicken burgers that they can be a bit dry but this was really succulent). By this point we were all starting to feel a bit stuffed (emmm and a bit tipsy....the wine kept flowing!) but once they brought out the dessert platters I think we all managed to find room. 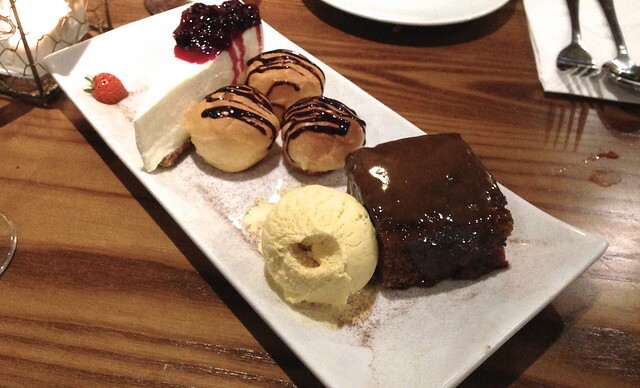 Here we had a fab selection of fresh profiteroles, vanilla cheesecake with fruit compote and sticky toffee pudding with ice cream - I think my favourite here was the sticky toffee (the ice cream was lovely too - really creamy). Once dessert was finished myself, Jade and Lynsey left to get the train home leaving the others to have a few more drinks, and judging by the hangovers they had the next day I think we made the right decision leaving when we did! Linlithgow isn't somewhere I tend to visit very often, in fact I don't think I'd been in about 10 years(!) but our night out has spurred me on to plan a trip to Linlithgow Palace with B one coming weekend so we'll definitely be popping to West Port for some lunch (I'm dying for more of that tempura chicken!). Thanks very much to Toni at DADA for organising and for inviting me along - sometimes I can't quite believe how lucky I am to get to go to things like this and enjoy food and drink with friends for free all because of this little blog. It's crazy really, but I'm enjoying the fun while it lasts!